In 2016, Philomene and her 6 children began a life in displacement after their village was targeted by armed men. After seeking refuge in a Catholic Church where they stayed for a year, she reached the camp of Lazare, Kaga Bandoro, in which they have been living for over a year. Philomene is disabled. She suffers from muscle dystrophy. Three years ago, her husband died of an untreated disease. 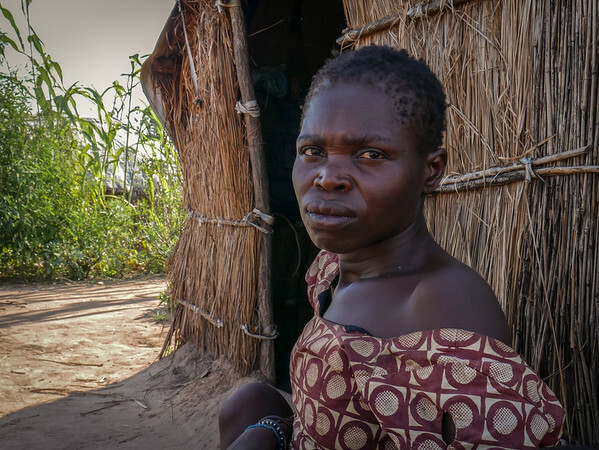 “I wish I could use my legs so my son would not need to skip school to fetch firewood. This our only source of income. He fetches the wood and I sell it. I earn about 300 Francs CFA (46 cents) a day, just enough to buy manioc powder. “I should be the one taking care of my eldest but instead it is him who is taking of me. When armed men attacked our village, he took all my siblings and ran away. I am disabled so why would they want to kill me? However, I also fled because everyone left the village. “I scrawled on my hands and feet and reached the bush. I stayed and hid in the bush for a week. I was terrified. There was no one around. There was no food but I was not even hungry because I was petrified. The most difficult was to not find water so I drunk stagnant water. “I fell sick but luckily after a week I reached the church where many other families took refuge. I found my children there. We stayed there for a year. “I am afraid to return home because we are alone. I am afraid that they come and attack us again. “I am not at ease here either but it is better than being there alone. I have a lot of nightmares in which I see my children being attacked by owls and cats. I wake up every night to pray for these nightmares to stop.